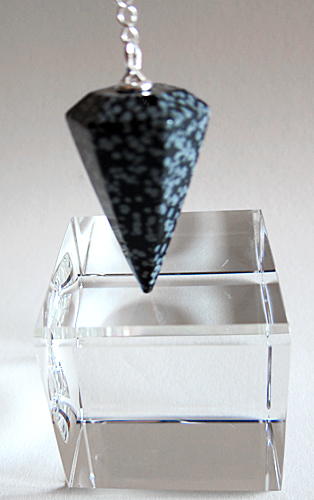 Dimensions (HxWxD): 1.5" x 1" x 0.125"
This pretty Snowflake Obsidian Pendulum has a marbled pattern made by the inclusions of the white mineral phenocryst, running through the black obsidian which according to Melody is what gives it the distinctive pattern resembling a snowflake when polished. Obsidian is a volcanic stone with a high luster to it, so it is both good for grounding and also for inner reflective work. 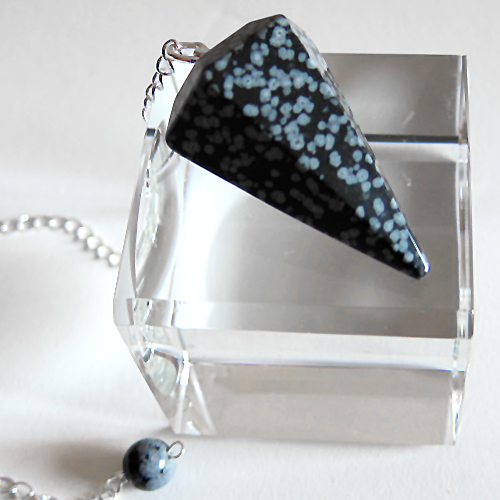 Snowflake obsidian is said to enhance the ability to realign patterns in our lives with those which will better serve us. According to Melody it is a stone of "purity" helping to balance mind, body & spirit. We often recommend that our Reiki and past life therapy clients work with crystals or gemstones for protection. All in all, a wonderful and beautiful stone to keep in your pocket or keep close at hand for any dowsing work you are doing! Learn more about amethyst in our Crystalpedia Blog. Check out the article "Using Quartz Crystals in Digital Technology, Healing and Meditation" for an overview of the metaphysical and mineralogical properties of quartz, and a step-by-step guide explaining how to cleanse, charge, and program quartz crystals for healing, meditation and other spiritual purposes. Note: weight above is shipping weight. Average Weight is 17 grams. Each piece may vary slightly in dimensions & appearance from above. Each piece is guaranteed to be beautiful & to meet with your complete satisfaction.